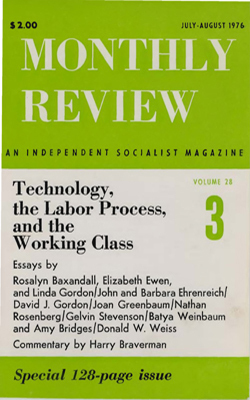 This issue of Monthly Review began as an invitation to one writer to review Harry Braverman's Labor and Monopoly Capital shortly after it was published by Monthly Review Press near the end of 1974. It soon became apparent, however, that there was no need to invite a review: a number of economists and sociologists expressed a desire to review the book or elaborate on themes either stressed or touched upon in Harry Braverman's analysis. So we changed the plan from a single review to a special issue of Monthly Review, inviting as authors not only those who had already expressed an interest but also others we thought would have useful contributions to make.